I am Emil. I am a student and I am 21 years old. 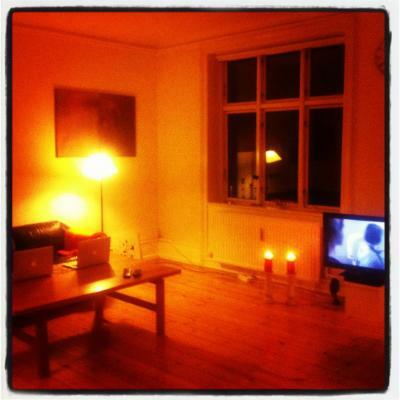 I live with my girlfriend Katrine here in central Copenhagen (Nørrebro). It is great located - 10 minutes walk from Copenhagen Central Station and Tivoli. Nørrebro is a great area in Copenhagen! We live in a huge 80 km2 apartment with 4 rooms. We have a balcony with view over the a beautiful graveyard. We have two TV, DVD, radio, Wifi etc. In the kitchen you will see a fridge, stove, microwave, a kettle and a washing machine. We have a small room - used as walk-in closet. Here you will find a tumble dryer. It is a very light apartment with paintings all over the place. The sleeping room is large with a huge closet as well.